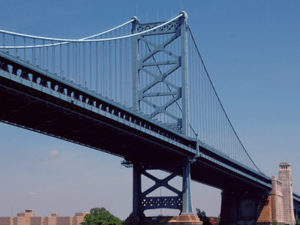 An official view of the Benjamin Franklin Bridge. The bridge was dedicated as part of the 1926 Sesquicentennial Exposition, celebrating the 150th anniversary of the signing of the United States Declaration of Independence. From 1926 to 1929, it had the longest single span of any suspension bridge in the world. Note: The above descriptive information came from Wikipedia. This page was last edited on 21 February 2019, at 16:20.